Dartford Creative has announced the launch of Dartford’s first Hidden Arts Hunt. There are seven pieces of artwork by seven amazingly talented local artists (yours truly included! ), all ‘hidden’ around Dartford. Except they’re not very well hidden – in fact, you’ll probably stumble over them in some quite surprising places! Each work of art has a code attached to it, text that code to 07592 894 208 and you’ll automatically be entered into a prize draw of £200. Don’t worry, this isn’t an arts based scam to get your mobile numbers and bombard you with emails or calls. The Dartford Creative people just think there are tons of very talented artists in Dartford and they want people to notice them. 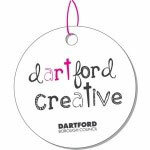 In case you’ve not heard about Dartford Creative before, it’s a creative project that’s been set up to highlight the work of Dartford artists, as well as encouraging more families and young people to visit and shop on the High Street. It’s run by Icon Theatre and Dartford Council, and holds weekly arts activities every Saturday on Dartford High Street. This week, at One Bell Corner for instance, they have a free event celebrating the Big Draw, a national event celebrating illustration and drawing, and need lots of young artists to come and help them create a gigantic illustrated poster!!! The Dartford Creative team want to encourage people to spot as many of the artworks as possible, so if you see more than one piece of artwork and text more than one code – you’ll be entered in the draw more than once. In fact, if you see all seven pieces of artwork, you get seven entries into the draw! Plus, they want to know what you think of the artwork. So, if you send feedback about the artwork along with the code (whether you love it or hate it!) you’ll automatically get two entries into the prize draw for each code. This means if you spot all seven pieces AND text what you think of them – you get a massive 14 entries into the draw! So start walking round the High Street now – and get texting!!! The Hunt launches this Saturday 19 October and will run ’till Saturday, 14 December. The Dartford Creative programme is supported by Dartford Council, Arts Council England and ROH Bridge. For more information please see www.dartford.gov.uk/creative or go to dartfordcreative.wordpress.com to see a list of the artists taking part. For all enquiries please contact Nancy Hirst on nancy@icontheatre.org.uk or call 07956 290172 or 01634 183179.